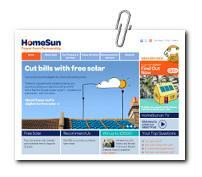 One of the first to offer free solar was HomeSun.com which established in 2009. Accoring to their site they claim to be the first company to offer free solar and SolarShare and has had over 100,000 applications of interest. The currently offer free solar, shared solar and also sell solar PV systems should you want to buy the panels outright and claim the tariff payments for yourself. The HomeSun free solar offer is a completely free solar PV system that is installed and maintained by them. The free electricity produced by their system means you should see your electricity bills reduced by about a third and cut your carbon emissions by twenty percent. The smallest free system on offer is a 2.4kWp which requires a minimum of 20m2 roof space. If you have a roof large enough they will install their 3.52kWp array which requires a much larger 26m2 of free space. After 25 years you become the outright owner of the panels at no additional cost. They partner with Carillion Energy Services who install the actual solar panel systems. The free systems are limited to locations south of Hull. In addition to the free option they also have a scheme called SolarShare that allows people who do not qualify for free solar. In effect this is free solar for roofs that do not face due south. There are still certain criteria that have to be met in order to qualify for SolarShare but they are less stringent. They do charge £500 to join this scheme so it is not as good as a totally free system. The £500 is charged because your house is not directly south facing so the money allows you to get the system installed in your house is facing between southeast and southwest, about 40 degrees off south. If your roof otherwise meets all the other criteria then you could try A Shade Greener who although also have strict criteria are not as stringent on your roof facing precisely south. Excluding the energy companies such as British Gas HomeSun is one of the biggest and most established free solar supplier in this very new market. Having contacted them via email they do respond quite promptly albeit being very succinct in their replies. My personal impression is that they are a legitimate company having a professional yet easy to understand website. Contact details including telephone and address are displayed clearly on the site. Homesun would definitely be one of the companies I would consider approaching for free solar panels. The only quip I have is with their SolarShare system that on the face of it seems to penalise customers for having a house that doesn't face south.